Click above for full size image. Psychedelic, back porch blues at its best! 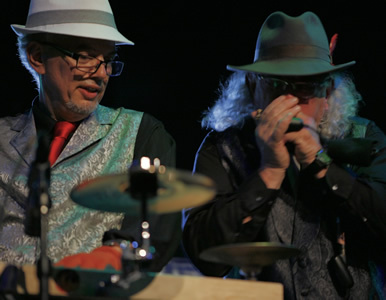 The Mojo Medicine Show is an unique blues duo that blends the jug juice of 1930's juke band music with the electric kool-aid jams of the 1960's. Please contact Mad Dog at maddogATmojomedicineshowDOTcom for booking or other inquiries! Or an Experimental Video Taste of Our New Electronic Album, Legalized.